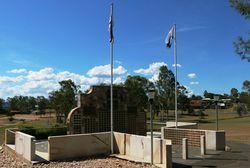 The monument commemorates truckdrivers and coach drivers who have lost their lives. 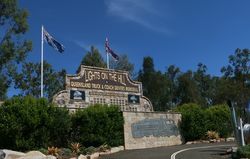 The Lights on the Hill truck and bus drivers memorial in Gatton`s Apex Park is the brainchild of Kathy White and is named after the Slim Dusty song. 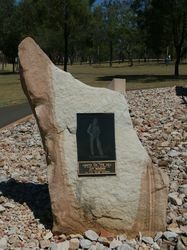 Slim and his wife Joy agreed to become patrons of the memorial before the Australian country star's passing in 2003. 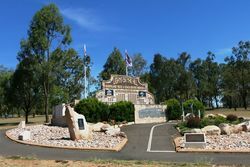 Patrons/ The late Slim Dusty A.O., M.B.E., Joy McKean OAM, Anne Kirkpatrick, John "The Ferret Moran "
Mrs. Kathleen White supported by husband Garry White, daughter Dionne White, Mr Kevin Saxby. 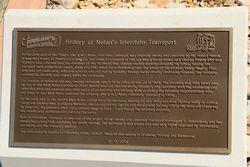 This wall has been erected to remember the truck drivers who are no longer with us. Truck drivers are a team of men and women who work 24/7 to keep our country moving. Without trucks on the road there would be no items in shops, fuel at service stations, plus other supplies, we the public need every day to survive and enjoy life. Please support our truck drivers we need them.